Motorcycling is not only a thrilling pastime but an economic way of commutation as well. More and more people are drawn to motorcycles, whether it’s for recreational purposes or traveling. Motorcycles are a very convenient form of individual transport, and an increasing number of people want to take advantage of a motorcycle’s better fuel economy. If you are familiar with any type of motorized two-wheeler, you should quickly be able to get used to a motorcycle. There are quite a few advantages to riding a motorcycle. An average motorcycle delivers the acceleration and speed of most sports cars and filling your tank is much cheaper. Plus, you’ll have easy parking no matter where you go. Most motorcyclists have a sense of camaraderie, and you’ll feel like a part of an exclusive club. SHOW ME THE TOP 10 LEATHER JACKETS NOW! A ride on a motorcycle can be very exhilarating, but it is not without its dangers. In 2016 alone, there were 5400 fatal motorcycle crashes (Source: Statista: Fatal motorcycle crashes in the U.S. 2016 | Statistic). Clearly, riding a motorcycle isn’t without its dangers, but that doesn’t mean you should give up on it entirely. Having the right apparel can go a long way in protecting you in the event of an unfortunate crash. That’s why, getting the best leather motorcycle jacket is important, among others. To make your selection process easier, we’re bringing you the best leather motorcycle jackets review. We’ll also go over some criteria you should keep in mind before purchasing a motorcycle jacket, to make your process a little easier. You need to decide how frequently you ride and how long your rides are. In essence, the type of protection you need from your jacket will be based on your riding style. The most basic choice you have to make is between a one-piece and a two-piece suit. A one-piece suit offers the best coverage and protection. It acts as full-body protection and sticks close to your skin. Additionally, it won’t flap around while you’re riding. If you’re racing your bike or moving at fast speeds on freeways, you should opt for a one-piece suit. They provide the best protection in the event of a crash. However, getting into a one-piece suit isn’t always easy. For more versatility, opt for a two-piece suit. These are the ones where the jacket and pants zip together to create the full suit. The best leather motorcycle jacket brands offer these two-piece suits and for the best fit, buy the pants and jacket from the same brand. This means that you can wear the jacket separately on short rides, which is more convenient than getting into a full suit. Your riding style will be a key factor in deciding what kind of jacket is suitable for you. The debate between which material is better – leather or textile – has been a long one in the bikers community. However, the material better suited for you depends on your needs. No matter what material you choose, though, remember that the jacket is only useful if the material is of excellent quality. Material quality will make all the difference when it comes to protecting yourself in the event of a crash. Low-quality materials will not protect you from abrasion and trauma in the event of a crash. Additionally, the material of the jacket will also be a good indicator of the overall quality of the jacket. High-quality leather jackets offer great abrasion resistance and will protect the wearer very well in case of an unfortunate accident. Plus, they give a classic biker look as well. Just make sure that the jacket is between 1.2 to 1.4 millimeters in thickness if it’s made of goat leather or calfskin. However, leather doesn’t breathe and can be stifling in summer without vents. Our buyer’s guide focuses on the best motorcycle leather jackets due to the material’s positive qualities. You can also get textile jackets, which are good for warmer weather since they breathe well. Nylon and polyester are common materials seen in textile jackets. There are also good quality denim biker jackets available. Although these materials breathe well, they can get chilly in winters, and don’t last as long as a quality leather jacket. Time moves fast, and the clothing industry moves faster. The best leather motorcycle jacket brands constantly compete to offer the latest and best designs and armor for a rider. The jackets are getting slimmer and more abrasion resistant. Better armor placement and materials are offered today than there were 5 years ago. Because of how fast the industry is moving, the newer jackets tend to be safer, and more comfortable than the older jackets. You may not think about this at first, but the age of the model of the jacket you’re purchasing matters a lot. Simply put, the leather jackets that were the peak of fashion and protection two years ago will not compare with the newest jackets that are in stores right now. Even if the jacket itself is new, it’s better not to buy an older model. Newer models will offer much better features. There may also be compatibility and sizing issues if you’re hoping to pair the jacket with pant for a two-piece suit. All said and done, the age of the jacket’s model matters a lot. Before selecting a jacket, check the age of the model. If it’s anything older than 5 years, think carefully about whether your safety is worth it. 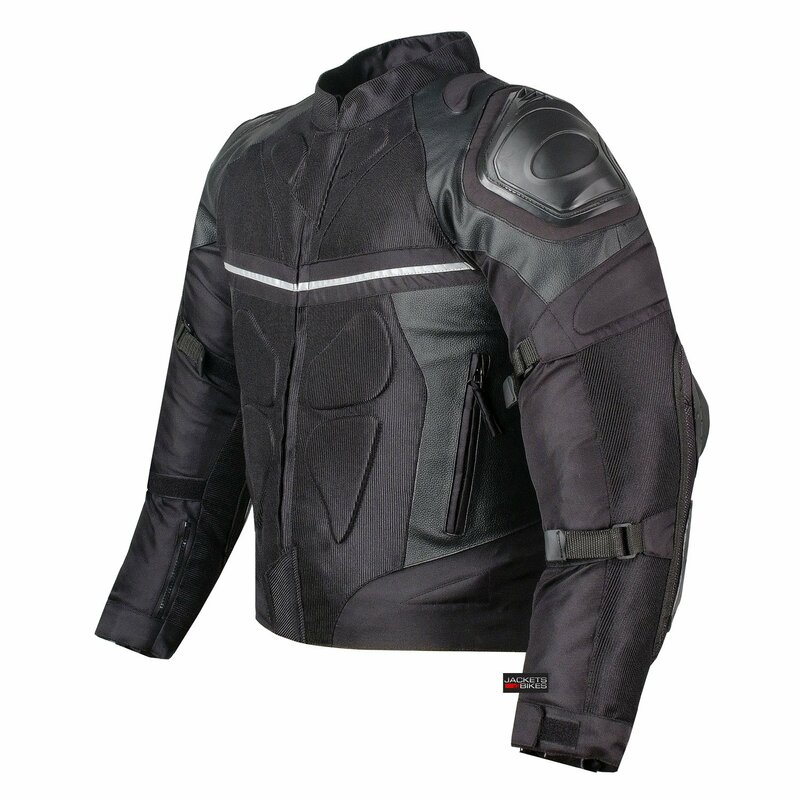 Black is often the most common color for all sorts of motorcycle jackets. Although this color looks classy and many bikers tend to prefer black jackets, they’re very hard to spot at night. This can present a great problem, as another motorist may ram into you simply because they didn’t see you. Being seen is a great part of avoiding an accident altogether. One option is to buy jackets in an easily visible color, such as signal yellow or orange. This will ensure you are noticed easily as soon as even a little light falls on your jacket. However, you may not find these colors appealing, especially in broad daylight. Another thing you can do is look for reflective panels on the jacket, such as reflective piping or logos. These shine brightly under headlights, so you’ll be pretty visible, but look completely ordinary during the day. Just make sure that the reflective material is situated where headlights will actually fall on the jacket while you ride your bike. These materials only shine in the direction that light falls on them. If the reflective material isn’t positioned well, it won’t shine as brightly, and you’ll still be at risk of being unnoticed by the other driver. Lastly, if your jacket doesn’t have reflective piping, you can always purchase reflective arm straps, or a high visibility jacket, like the ones construction workers wear. You can wear these over your jacket if and when needed. The jacket you’re buying should not only use good quality materials but use them in the best way possible. Pay attention to how the jacket is made before deciding to purchase it. Some key things that you should look out for are listed below. The seams of a motorcycle jacket should always be on the inside, so they don’t cause abrasion in the event of an accident. In case of leather jackets, the fewer the seams, the better. This is because more seams can compromise the integrity of the jacket. Additionally, all good motorcycle jackets have doubled up seams to prevent the jacket from bursting open in the event of a crash. Zippers are another important thing to look at before you decide to purchase the motorcycle jacket. The zippers are either plastic or metal and should meet a few criteria to make sure the jacket provides maximum safety. They should be covered with a flap of fabric, which can protect against injury in event of a crash. Also, they should open and close quickly and easily. This will add to the convenience of the jacket. Safety should be your first and foremost concern when buying a motorcycle jacket. It should be able to protect the most vulnerable areas like the back, the elbows and the shoulders. For this reason, motorcycle jackets come with armor that you can insert in the pockets inside or outside the jacket. Before considering the armor, however, you need to consider the material itself. We have talked about how leather tends to be sturdier than textile jackets, and this is because leather is denser. Because of this, the material tends to stretch and disperse any force during impact. However, textile materials can’t stretch, and hence, can tear more easily. If you want a textile jacket but a sturdy one – look for options reinforced with leather or Kevlar. If you want good grade armor, check if it is CE approved. There are both CE1 and CE2 levels of approval available for motorcycle jacket armor. The CE2 approved armor offers better protection. For the appropriate armor for your jacket, check if your protectors are large enough and flexible enough to absorb shock and protect you from damage. If your jacket is very close fitting, the armor should be on the outside. If it has a looser fit, the armor should be placed inside, closer to the parts it’s supposed to protect. For maximum safety, we recommend placing the armor inside the jacket. The protectors shouldn’t restrict your movement but fit snugly. You want it as close fitting as possible so that the armor doesn’t get displaced in the event of a crash. However, you want to be able to articulate your arms freely. See if you can comfortably sit on your bike and operate it freely in your jacket. There are several different types of armor, including memory foam, dual density foam, branded armors, and plastic over foam. 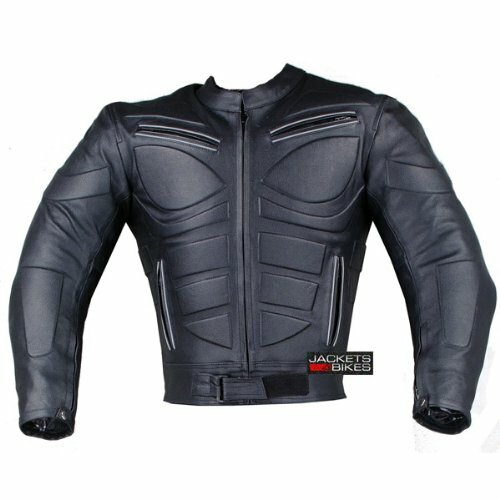 The best leather motorcycle jacket with armor will definitely fulfill all the mentioned requirements. The best leather motorcycle jacket doesn’t just offer protection, but great comfort as well. Once you’ve narrowed down your search to a few potential jackets, the comfort factor can help you decide on the perfect motorcycle jacket for yourself. You should look out for the weight and fit of the jacket. It will affect how comfortable the jacket it, which can be very important in the long run. If a motorcycle jacket is not comfortable, you may be tempted not to wear it often, which can be dangerous. When it comes to the weight of the jacket, leather motorcycle jackets tend to be heavier than the textile jackets. They also tend to have fewer storage pockets to store your possessions and money. If storage is important for you, you might want to consider a textile jacket. Also, pay attention to the general weather conditions in the area you usually drive. The leather is not the best choice for rainy weather, for example. This is because leather tends to get mildewy and heavy in humid and rainy weather. If a textile jacket comes with special waterproofing, then the jacket will remain comfortable even in rainy weather. Or you could just get a separate rain jacket that will fit over your regular jacket. Likewise, if it’s cold, leather offers much better protection against chilly winds. However, leather tends to offer very little heat resistance against the sun or your own body heat. The temperature of leather varies with the weather, so you might want to look at options with lining for colder weather, and vents for warmer weather. Textile jackets will need an additional inner layer to be warm enough on a ride. As discussed before, the fitting of the jacket plays a very important role in making. The best leather motorcycle jacket will be the one that fits you as well as possible. When checking if the jacket fits you well, there are a few key points you should keep in mind. The jacket needs to be snug when standing as well as sitting. Try on the jacket in the position you’re gonna be in on your bike. If it fits perfectly and does not shift around, it’s a good fit. However, you also have to make sure that you can move your arms freely. Being able to move your arms is a very important part of your jacket. If you can’t articulate your arms properly during riding, driving will become much more difficult and dangerous task for you. Make sure you can turn the handlebar comfortably. Also, check if your sleeves are long enough to cover your wrists properly when you’re in the position to ride the bike. Ideally, there should be proper overlap between your gloves and jacket sleeves when your arms are bent in the position they’re gonna be in while you’re driving your motorcycle. The zippers on the jacket should be well covered, to keep from causing further injury during a crash. Zippers should also feature on the cuffs of the jacket, to make sure the sleeves don’t slide up. This means that in the event of a crash, no skin will be exposed, which will definitely reduce the risk of abrasion. Your motorcycle jacket needs proper maintenance, just like your motorcycle. You should regularly clean out your motorcycle jacket, as this can be beneficial in many ways. Proper maintenance can increase the lifespan of the jacket, help it look good for longer, and of course, is hygienic. If you own a leather jacket or plan to buy a leather motorcycle jacket, then you should know that you need to regularly treat it with a leather balm, leather oil, or petroleum jelly. This will keep the leather from drying out and hardening. If you need to clean it, use a soft cloth and dilute soap solution, wiping off any excess cleaning solution when you’re done. Use waterproofing spray before you rub the oil into the leather. This will keep the leather from absorbing water and developing stains. When applying the leather oil, make sure to use a soft cloth as well as rub in the oil with gentle, circular motions. Depending on the color of your jacket, you can either opt for a colorless jelly product or use black grease. If you have a textile jacket, you’ll notice that they come with detailed washing instructions. In this case, always make sure to follow the given instructions. Always use mild detergent and lukewarm water, not above 85 degrees. Every textile jacket is different, so you might want to get it professionally cleaned if you can afford it. Searching for the right leather jacket can be hard, and there are a lot of things that you have to look out for, as mentioned before. 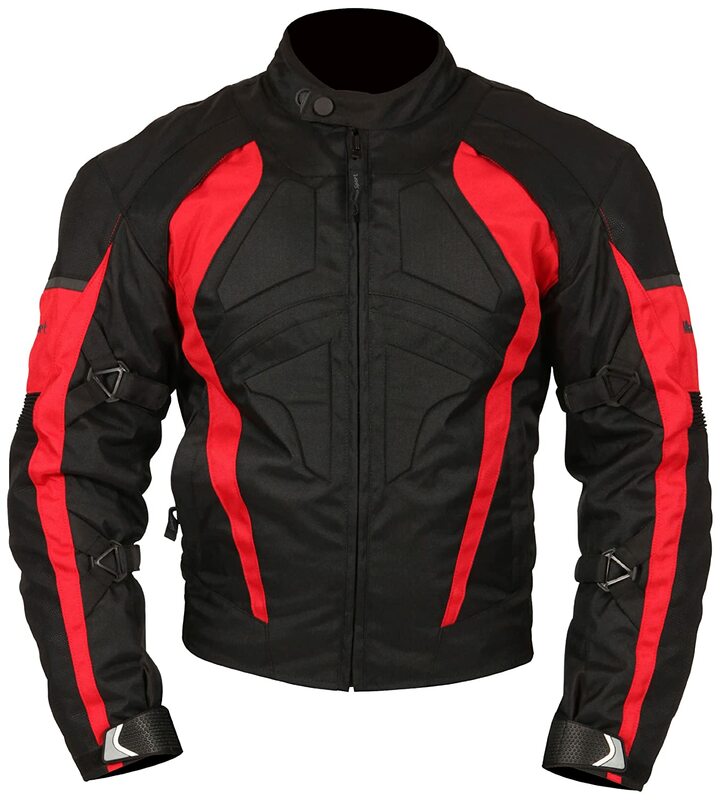 It can quite a daunting task to choose a motorcycle jacket, especially since they are quite costly. To make your selection process easier, we have compiled a list of the 10 best motorcycle leather jackets. Milwaukee Leather is one of the best leather motorcycle jacket brands around and proves it with this jacket. If you don’t want to invest a big amount of money right away, but still want a quality leather jacket, this is the right choice for you. It features premium milled cowhide, which is 1.2 to 1.3 millimeters thick. The thickness is enough to protect against abrasions as long as the bike isn’t going too fast. This jacket is highly adjustable, which provides a snug and comfortable fit for every unique size. The jacket comes with side lace detailing, and a half belt. These features allow you to tighten and loosen the jacket as needed so you have the perfect fit. 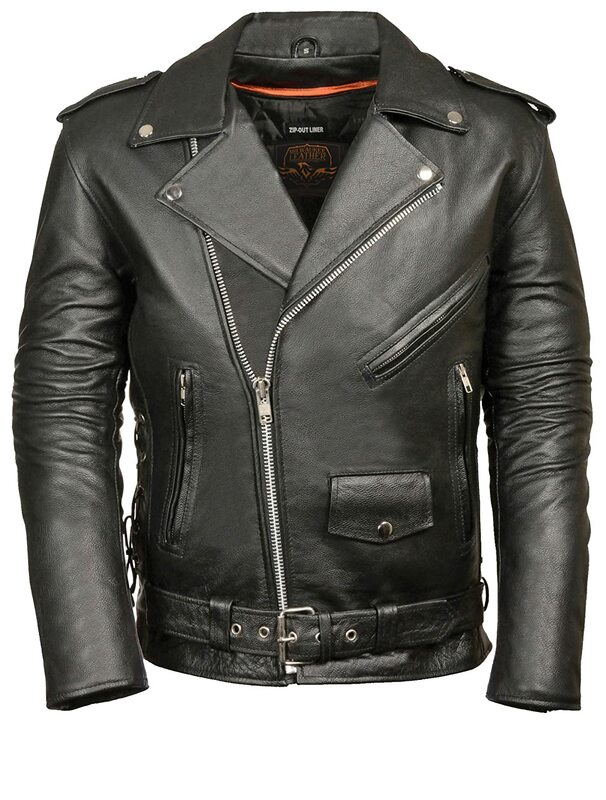 The jacket is completely black, with a classic biker style and look. As for storage options, it comes with two lower zippered pockets. These pockets also come with a ticket book snap-close storage pocket. If you live in a colder area, you are in luck with this jacket. It comes with a full sleeve zip out thermal liner. This will help protect you against the wind chill while on your bike when it’s really cold outside. If there is a downside to this jacket, it’s the lack of armor and pockets to add the armor in. Additionally, it has no reflective paneling, so it’s not great with the visibility aspect either. However, for the price, it’s quite a premium jacket. If you’re going to be cruising around, and need an entry level jacket, then this leather jacket is the right choice for you. 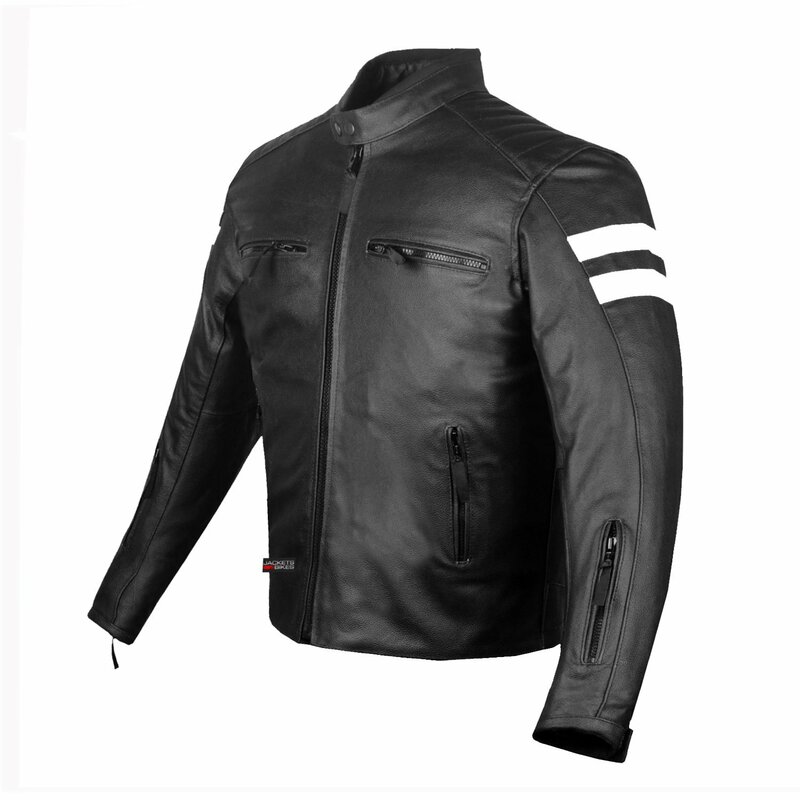 This is another great quality leather motorcycle jacket that comes at an affordable price. This jacket is constructed from top quality cowhide as well, and the construction quality is great, especially for a jacket that comes at such an affordable price. The construction of this jacket is quite solid and will protect you in a low-speed crash, as testified by many users of this jacket. It features doubled up seams to prevent bursting open, and YKK zippers, which are the industry’s standards. A great feature of this jacket is the reflective stripes. There are stripes of the reflective material on the chest, arms, and the back of this jacket. This greatly increases the visibility of the rider and will help avoid a crash. 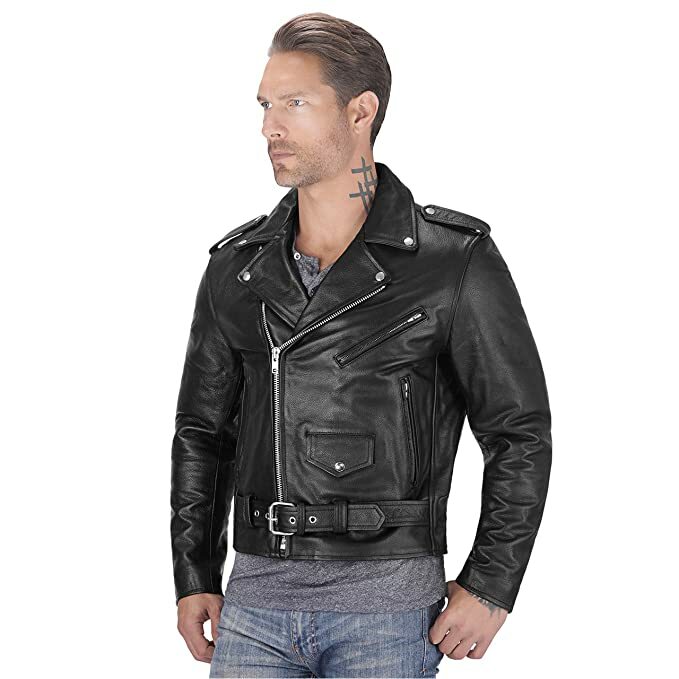 The jacket itself is otherwise completely black in color, quite classic for a leather jacket.It also features sleeve zippers for customized fitting, side waist adjustments, and a collar snap button, all for making sure the jacket fits perfectly. There are two front zipper pockets provided for storage space. Perhaps the greatest advantage of this leather jacket is that it comes with removable armor on the elbows, shoulders, and back. These are all crucial areas to protect in the event of a crash. 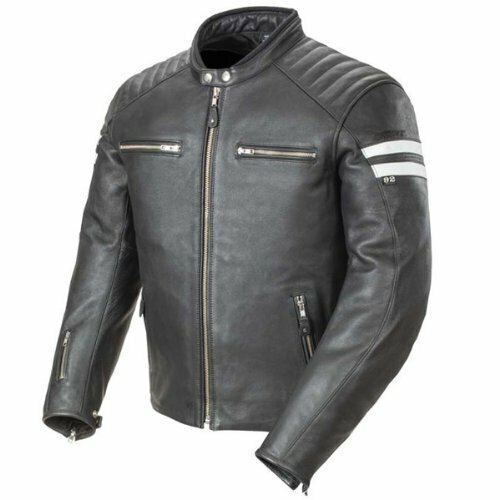 All in all, this is the best leather motorcycle jacket with armor if you’re looking for a good quality jacket at an affordable price. This is another great jacket that you can opt for good protection. It is also at the lower end of the price range, so you don’t have to worry too much about this burning a hole in your pocket. One of the great things about this jacket is the fact that it’s completely waterproof. It also comes with a removable thermal quilted liner. It also comes with front and back vents that can be close by zippers, so you can wear it in all seasons with a few minor adjustments. Another great feature is that it comes with removable CE-approved armor on the shoulders and elbows. Adjustable velcro straps on upper and lower arms allow you to customize the fitting of the sleeves. It also comes with an adjustable waist belt held in place with velcro. It fits snugly due to this customizable nature. Although the front and rear of the jackets don’t have armor, they are padded for protection, and you can always separately purchase better armor. The jacket looks great, entirely black with colored accents. You can choose from white, red, green, blue. In conclusion, this is a great buy for a safe ride. Cowhide is a popular material for leather jackets, especially for motorcycle leather jackets, due to its durability and the fact that it’s easily available. This leather jacket is also constructed from cowhide and is 1.2 millimeters thick. This jacket features armor in the shoulders, elbows, and back. The armor is constructed using injection molded plastic combined with foam for good quality protection. The full sleeve quilted liner inside the jacket is removable, which is great if it needs to be cleaned out. There are two ventilation zippers provided on the chest area in warmer weather. For adjusting the size of the jacket, it comes with zippers on the sleeves as well and 360°, 8 inch dual zippers around the waist. These zippers can help attach the jacket to the pant to turn it into a full suit. The two external hand pockets add an extra layer of comfort. It also features multiple other pockets and hence is very convenient when it comes to storage space. However, the jacket is a very deep blue color and has no reflective piping or paneling. Additionally, some users have mentioned size issues. However, it’s a great pick for a very sturdy and safe jacket. This leather jacket is made of premium grade leather cowhide and is quite durable and long lasting. It also features waterproof YKK zippers, ensuring that the water does not get inside the jacket in case of rainy or damp weather. One feature that stands out from the other leather jackets is the storage space in this one. It features several pockets for various devices you want to keep with you, and even a headphone wire system to comfortably listen to music when off the motorcycle, without having to take off the jacket. The belted waist ensures that you can adjust the fitting as needed, so the jacket stays snug to offer the best possible protection. It also featured adjustable cuffs, so that the sleeves are well in place and that prevents air from getting into the jacket on cold days. This is quite an aesthetically pleasing jacket, and you’ll definitely feel like a biker in the classically styled black leather jacket. The quilted polyester lining on the inside will help protect against wind chill and ensure a comfortable wearing experience. Again, the problem with this jacket happens to be the visibility in dim conditions. It’s got no reflective paneling. Additionally, it doesn’t come with any armor. Overall, this jacket is best for casual rider who won’t be going too fast, and need a stylish jacket at an affordable price. Joe Rocket is another very reputed brand for motorcycle jackets, and this one offers quality at a very reasonable price. This jacket is available in several colors, so if visibility is an issue for you, then you can get a much brighter color if you wish. This jacket features combined waterproof treated Rock Tex and Hitena outer shell, which provides impressive impact resistance and abrasion resistance in the event of a crash. The zippers used are also waterproof, so the jacket can be worn with ease during wet weather as well. It also features externally accessible CE approved armor in for shoulders and elbows. It also comes with a removable spine protector with a pocket so you can insert CE approved armor for the spine as well. This jacket clearly provides top-notch protection. One of the unique features of the jacket is the ingenious Variable Flow ventilation system, which comes with Cross-Linked Ventilation and Wind Tunnel Cooling (patent pending). This makes sure that the jacket is quite cool and comfortable even in hotter weather. The neoprene cuffs make sure the jacket fits well and feels comfortable as well. The 6 Point Sure Fit adjustment system ensures that the jacket is snug and fits every individual in the best way possible. All in all, this is one of the best leather motorcycle jackets at an affordable price. 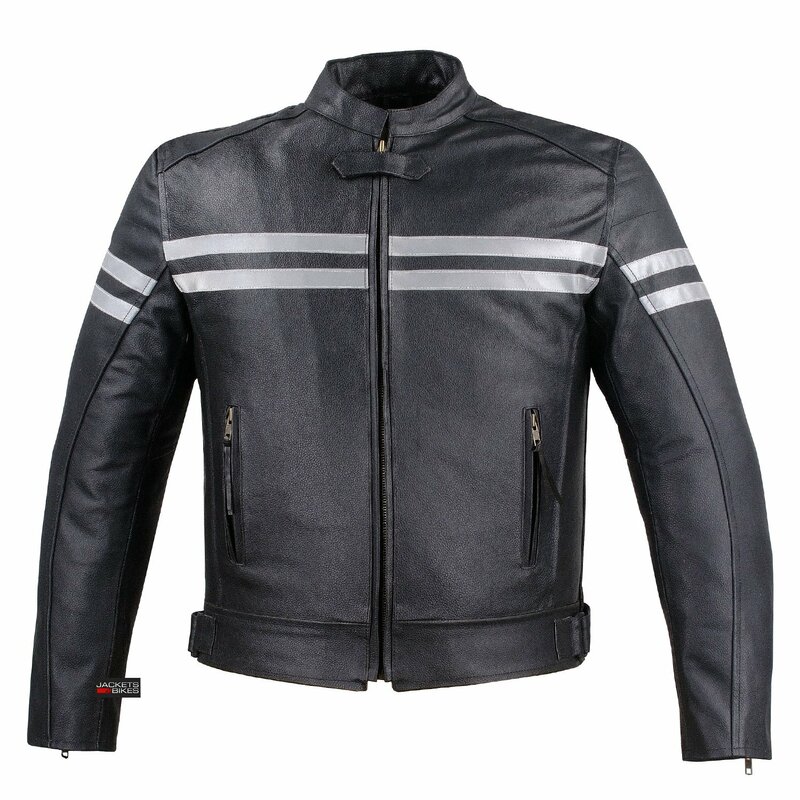 This is another great classic style motorcycle jacket which is very stylish and great for touring motorcyclists. It is made from top grain leather, and provides quite a bit of protection in case of low impact crashes as well. For customizing the size of the jacket, this motorcycle jacket provides side laces and a half belt. This makes it easy for the jacket to fit on people with different body types as well. The three zipper pockets are great for storage and will keep your items safe. The zipper cuffs make it easy to put on and take off the jacket. This jacket is quite notable in the customer reviews for the quality of the leather. The leather is also pretty heavy, and truly gives the look and feel of a classic style jacket. The lining of the jacket is quilted and can be zipped out. This means that you can clean out the jacket pretty well if and when needed. 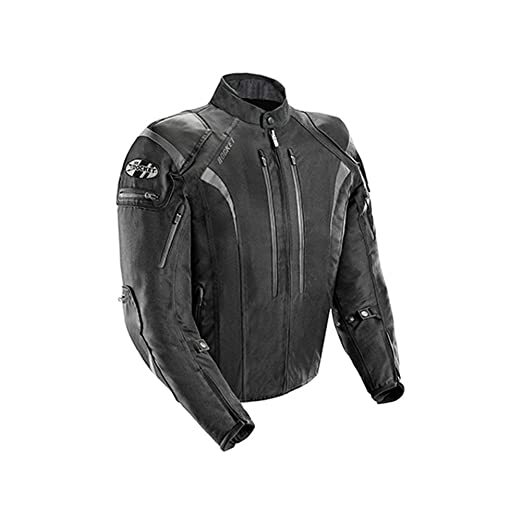 This leather jacket offers superior protection and is great for riders who seek a bit more thrill or those who ride at higher speeds on highways and like. The unique feature of this jacket is the double armor, which provides extra protection to make sure you’re as safe as possible. The hard plastic foam armor is stitched on the outer shell of the jacket, while the double density foam armor is present on the inside of the jacket. It also comes with a removable waterproof lining, so it’s comfortable in all sorts of weather. Like all good motorcycle jackets, this one also comes with adjustable arm straps and external pockets with zippers. The material is also pretty breathable, making it suitable for warmer weather. The SureFit customization option provides complete control over the fitting of the jacket. It also features reflective piping to make sure the rider is visible in poor light as well. This is a well-rounded jacket, with a lot of great features. This is the best leather motorcycle jacket if you need all features at an affordable price. This is another great jacket by Joe Rocket. It is available in black and brown colors, with a few variations in the color of the accents. The top stitched 1.0 to 1.2mm drum dyed cowhide is tailored carefully for a comfortable fit. Pockets are provided for armor at the all the vital spots such as the shoulders, elbows, and back. The zip-in quilted full sleeve liner provides excellent resistance against the wind chill while driving in cold weather. This jacket also features an adjustable neoprene-lined Mandarin collar, which is stylish and comfortable. The 1.5 Inch Storm flap at main zipper adds to the comfort and safety of the jacket. The jacket also comes with two utility pockets on the inside and additionally features 4 pockets outside. So storage space isn’t an issue with this model. The jacket is styled like a classic biker jacket, so if you prefer that look, then you should surely go for it. Like a few jackets mentioned earlier, one of the problems with this jacket happens to be the visibility. It has no reflective paneling, and hence will not be as visible in dim lighting. To fix that, you can always opt for buying reflective armbands. Overall, it’s a great classic leather jacket that is stylish and practical. 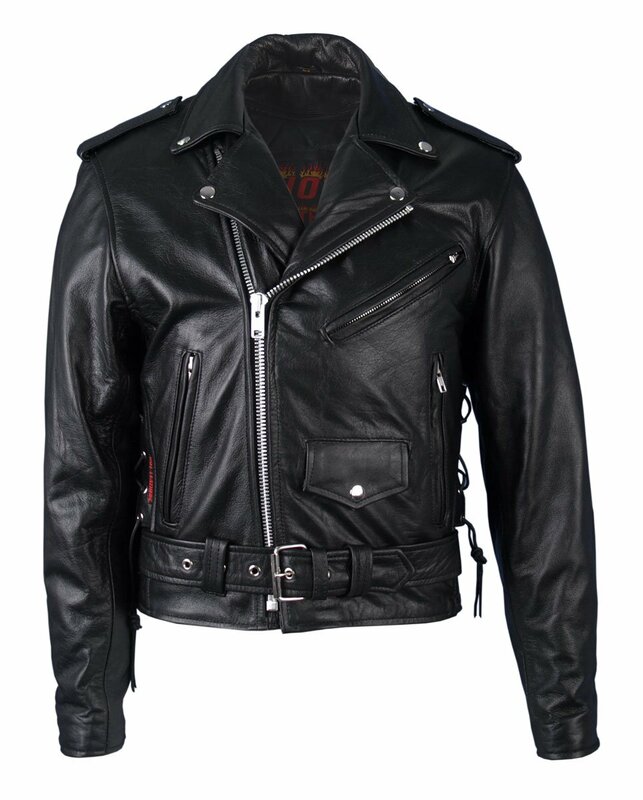 This jacket is made of the standard 1.2 to 1.3 millimeters genuine cowhide leather as well. It comes with reflective stripes on the arms and back, so your visibility is quite good. As for storage space, this jacket features four front pockets on the outside, and sleeve pockets as well. All pockets are secured by a zipper, so you don’t have to worry about your possessions falling out. Other features of this jacket include the removable quilted liner, five-section removable armor made with injection plastic and foam, or double density foam. The front zipper closure is quite secure and uses a superior quality zip as well. The collar features dual snap buttons, to secure it in cold weather and prevent air from getting in while riding, as well as zipper cuffs for a good fit. All the zippers are YKK and great quality. Overall, this is a great jacket with plenty of features at an affordable price. Now that we’ve been over the general guidelines and tips, as well as the 10 best motorcycle leather jackets, you probably have a good idea of what jacket you want. As always, remember that high prices do not always equate quality, and you should select a jacket based on your priorities. We hope this guide helps you stay as safe as possible on the road.